How many African Hip Hop artists do you know? Could you name five? Of those five, who is your favourite? While hiphop in America has slowly lost its cutting edge, or if your Nas "dead"! In Africa its the opposite. Hip-Hop is on the up and up, It is slowly replacing RnB, it is, the new cool! Kids on every corner are 'spitting rhymes and bullets' and idolizing legendary Hip Hop artist such Tupac, Biggie, Nas, Jay-Z e.t.c more than ever. The art and relevance of hip hop is growing in influence. Even more, the old guard generation of MC Solaar and Kalamashaka are now being replaced by talented and ambitious young African artists such as K'naan, D'Banj, SixFoot, Pro kid, Skwatta Camp, Sarkodie, Camp Mulla and the endless list goes on. Those who have been fortunate enough to meet (our guest) this young Kenyan artist talk of him in the same lines as the aforementioned group!Known by his stage name "Voodooseller" real name Elvis "Babu" Mashengu is an intriguing artist. His style is Unique (Click on the first video) where east African hip hop is concerned, he's being compared to Busta Rhymes and some has described his style of rapping as a form of "speaking in tongues". The African Perspective Magazine recently caught up with Voodooseller in Nairobi for his first exclusive international interview. If you've never heard of him, keep on reading coz its not the last time you'll hear of him. TAP; Introduce yourself to Tap, where were you born, where did u go to school as a kid and what are your favourite childhood memories? What's the story behind your stage name? Voodoo; My real name is Elvis “Babu”. Mashengu aka the Voodooseller. Others call me the Grim reaper but I'm just that simple down to earth guy from the Eastland’s part of Nairobi. Born in Huruma and raised in Jerusalem, I understand and respect the hustles that come with a hard knocked life and this is what i base my craft on. I try to expose the negativity and preach positivity through this music platform. I went to school in Ofafa Jericho Primary School, am a very straight forward guy who tells it like it is. My stage name came to be through the combination of my childhood nickname and my style of rapping which guys said "it's like speaking in tongues or calling the spirits". TAP; When and why did you start making music? Who was your inspiration? Are you a self motivator? Voodoo; I do Music for the love of music. It. My love for music began way back when I was a kid and the inspiration comes from different people and situations I've been through. For instance, my brothers always believed that i was the best rapper even when i didn’t believe in myself; they were always pushing me. TAP; Were your parents for or against you becoming a musician? Voodoo; At first my mum thought it was a waste of time but one day i was shocked to see her in the crowd while i was competing in the 'UHURU CELTEL MUSIC SPONSORSHIP' and i nearly chocked on that Mic.After seeing how the crowd reacted while i was on the stage, she made a full turn and now she supports me wholly. TAP; What is your favourite music album? favourite hip-hop song? TAP; Who are some of the artists you've collaborated with? TAP; You have a pretty unique and new style in the local scenes... tell us how you came up with that style and how people have responded to it? TAP; Your hit song Hip Hop Politics! Can you tell us all about it? What inspired it? TAP; What does mainstream music mean to you? TAP; What else do you do beside music? How do rising artists make ends meet in Kenya? What’s your view on piracy? TAP; What are the three issues affecting the youths in Nairobi the most today? Voodoo; Hip Hop Is a Culture, a way of life, a movement hence it’s hard for it to die, so I don’t agree. I think Nas spoke in a metaphorical way, which states that, the educative & Real life experience hip-hop is no longer there, the kind of hip hop we have is not like the good old days. TAP; What is the most played song (other than yours) on your iPod? TAP; Whose music career (dead or alive) would you want to model yours against? Voodoo; JAY Z, BUSTAH, LUDACRIS, KANYE WEST, NAS, MICHEAL JACKSON; Mostly because of the respect and successthey have gained in the industry. TAP; When should we expect an album or next single from you? TAP; If you could work with any artist outside Kenya, who would that be? TAP; What are some of your hobbies? TAP; If you could perform at any venue/arena in the world, where would that be? 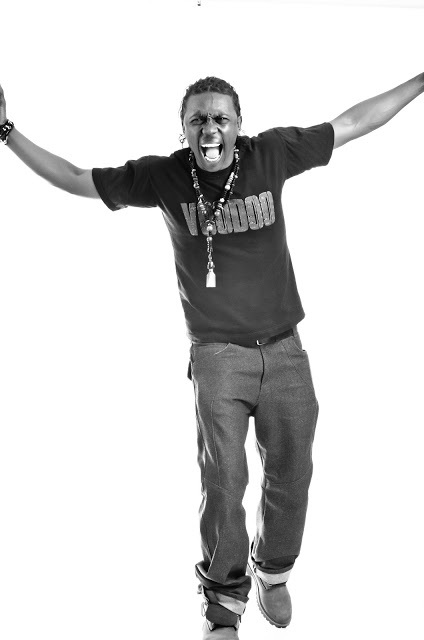 Voodoo; Cochellah, BET, MTV, STAPLE CENTRE, Anywhere as long as am there representing Music and hiphop. It doesn’t real matter where you are; you do it for the love of music. Spread the music, spread the love. Special thanks to Elvis and his entire team for being super professional and for making our job very easy. His a well rounded artist whose invested in poodle around him which makes it easy to work with. Also, thank you to SpaxTheRoyal of Jayels Family for his work on this project.